Some time ago designer and publisher Svea Gustavs, living in Amsterdam but born as a citizen of the German Democratic Republic, spoke these magical words that lead to this book. Together we sat and opened my boxes of pictures, went through my archive and examined it with the eye of a historian. For more than twelve years I had travelled the countries of Eastern Europe and the former Soviet Union reporting on all kinds of developments. I used my camera in my attempt to understand what was unfolding. I first travelled to Belgrade in 1987 to visit a friend, I was a student at an art academy and the big outside world was tempting. I made plans to see it all. At the time, my only experience with the Eastern Block was a school trip to Berlin in 1983, so what did I know? I simply travelled further on and the history was there to witness. 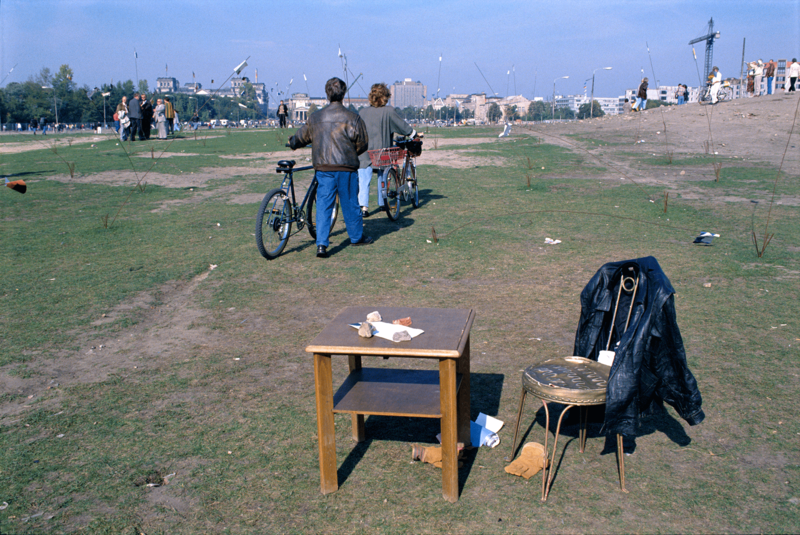 Once the closed borders opened, the developments and revolutions attracted more curious people like me. I became part of a community of journalists and photographers who together made new plans after every trip. There was always a reason to do so. Working with local interpreters and “fixers” (patience was indeed a virtue) I spent much time and effort to gain access into places and to observe the people involved. I once heard wise words from a famous violinist who said that you should never show how much you practice while giving a performance. 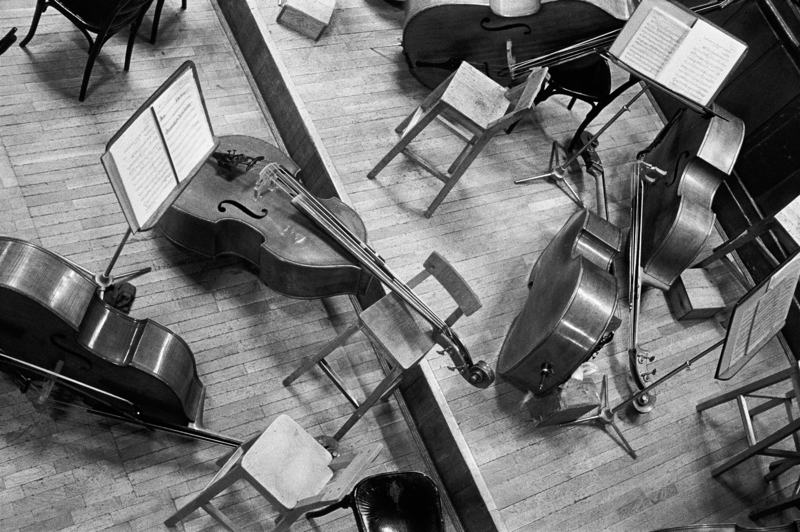 The most difficult piece of music should sound like it’s the easiest thing in the world. I kept these words in mind whenever I made pictures in difficult or hard to get in situations. My mantra: “be the observer, ask questions but let the scene do the work, do not interfere but look, listen and respond”. At that time there was also a revolution going on in the media. In my profession digital techniques and the internet changed everything. The craftsmanship of a professional photographer was no longer exclusive. Everyone had the possibility to communicate with photography and to publish on the internet. That’s a great thing. Photojournalists are front liners. We go ahead. We were among the first to build websites and distribute our work via new media all over the world. But there was a kickback as well: when things got bad in the printed media because of decreased ad revenues, the first budget cuts were on photography. Even in the early 1990s, when I published hundreds of pictures a year, it was difficult to make a living from the kind of work I did. These days it is virtually impossible. Newspapers and magazines hardly publish time consuming observing photojournalism anymore. 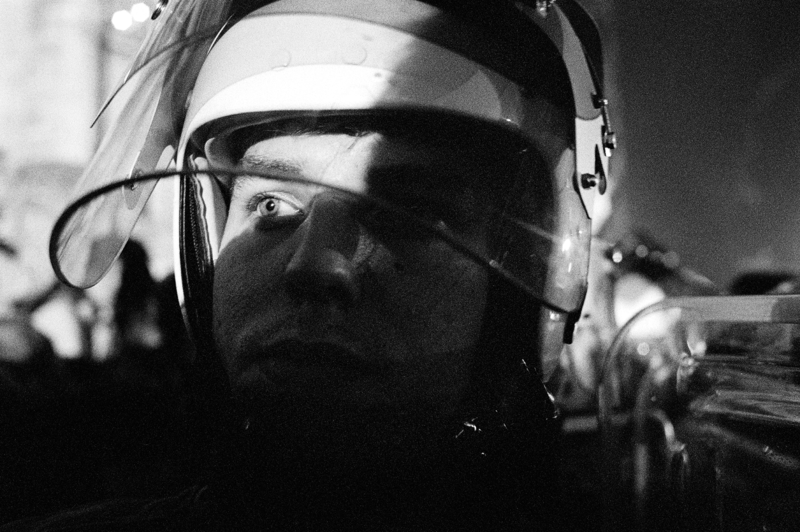 Photojournalists like myself found support in the art world and in private funding. I received grants that made it possible for me to continue working for a while until I decided to go in other directions. 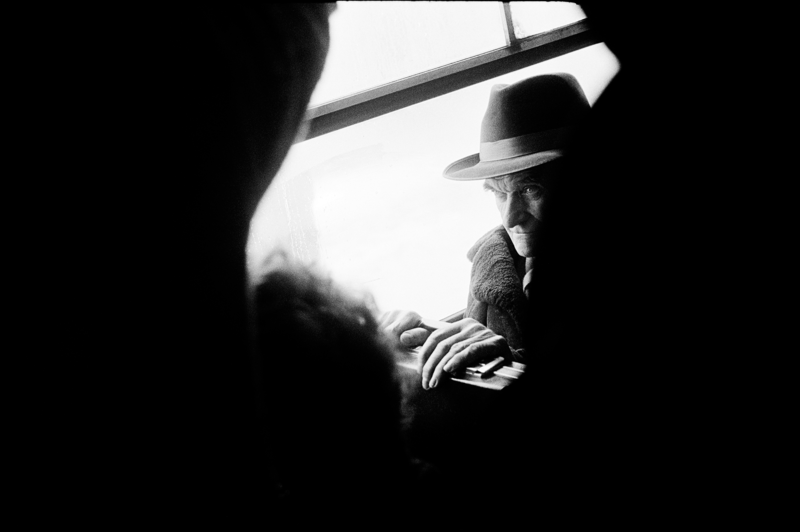 I started working on non-journalistic photography projects, documentary films and became a teacher at an art academy. Everything in this book is history, it has been ten years since I made my last pictures in Russia. I took some time to find out what would be the use of a book like this. For three years drafts of this book were shown at the Bookfair in Leipzig where we listened to visitors reactions. It was there that we found out who would be our audience. This book is for the people it is about, for those who lived through it or whose parents or friends were involved. They represent the histories on which many divergent opinions are expressed. And myself ? I was and will remain an outsider; I was there and I looked around. 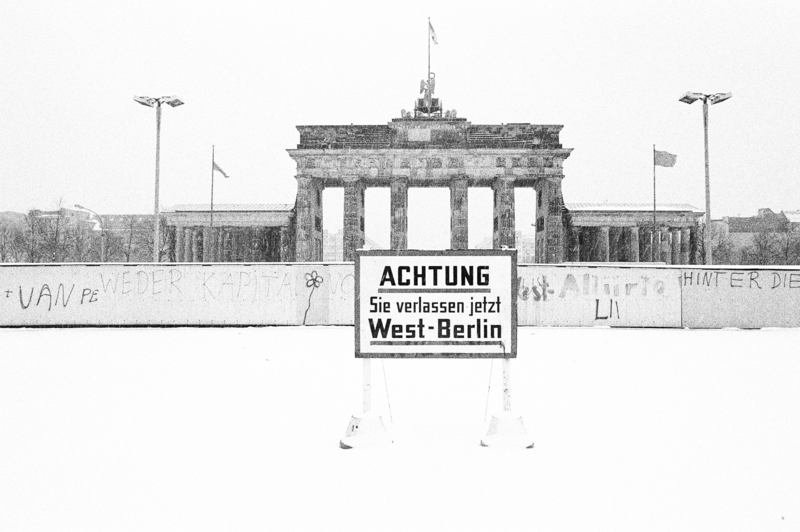 West Berlin, 1983. Berlin Wall (Berliner Mauer) seen from the West side near Potsdamer Platz. The Berlin Wall was a barrier constructed by the German Democratic Republic (GDR) that from August 13, 1961 completely cut off West Berlin from surrounding East Germany and East Berlin. 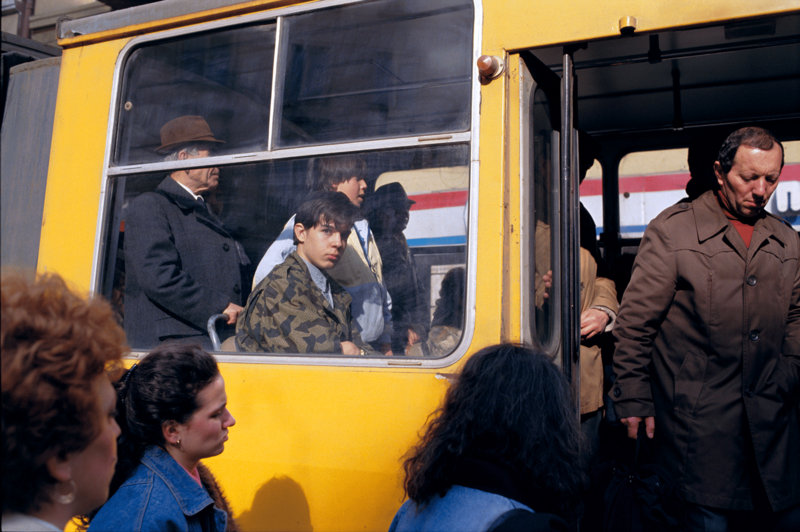 Budapest, Hungary, 1987. 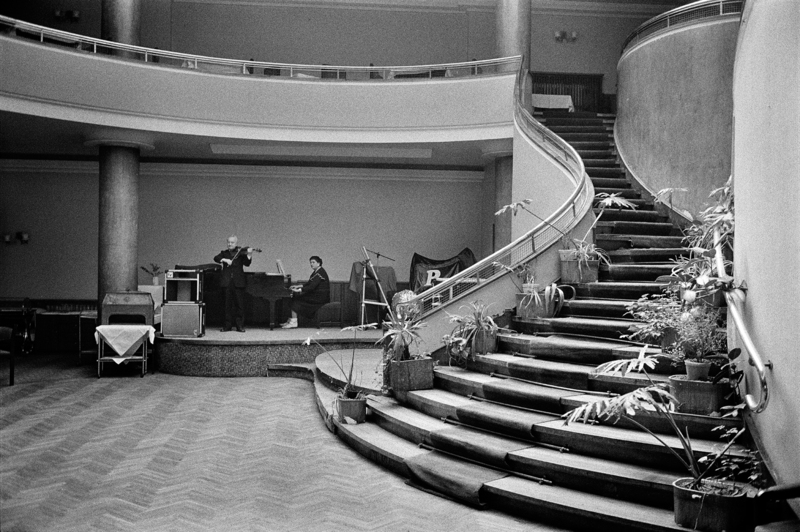 Concert hall of the Franz Liszt Academy of Music. Warsaw, Poland, 1987. Lazienki Park. People listen to music by the Polish composer Frédéric Chopin (1810-1849). Since 1959, on Sunday summer afternoons, free piano recitals of Chopin’s compositions are performed at the base of Chopin’s statue in Lazienki Park. 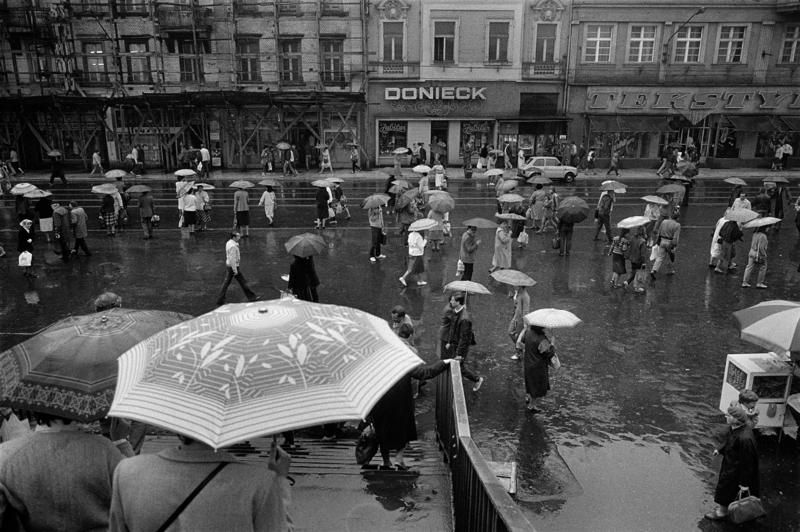 Prague, Czechoslovakia, 1989. Mánes Bridge. On top the Prague Castle, the seat of the president. The Tatra trams produced in the Czechoslovakian factory CKD were in use all over the Eastern Bloc. 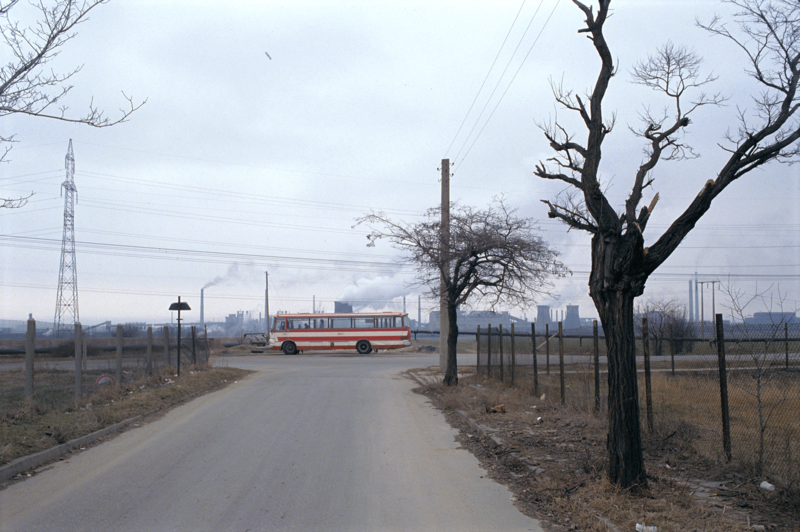 In 1968 the factory delivered wagons to the German Democratic Republic (GDR). They were too heavy for the rails and over time the cause of broken roads. Eastern Germans spoke of “Dubček’s revenge”. 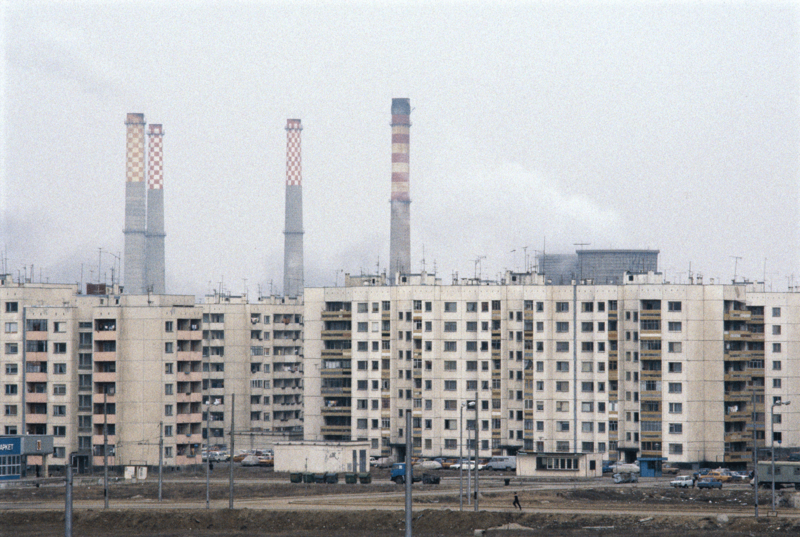 Częstochowa, Poland, 1987. Pauline Monastery of Jasna Góra, home of the Black Madonna painting, a shrine to the Virgin Mary and the most sacred place in Poland. 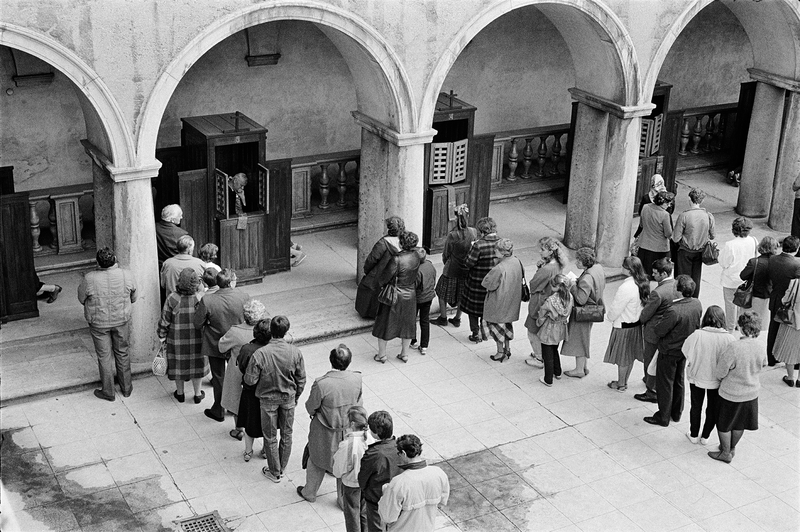 Catholic pilgrims stand in line for confession. 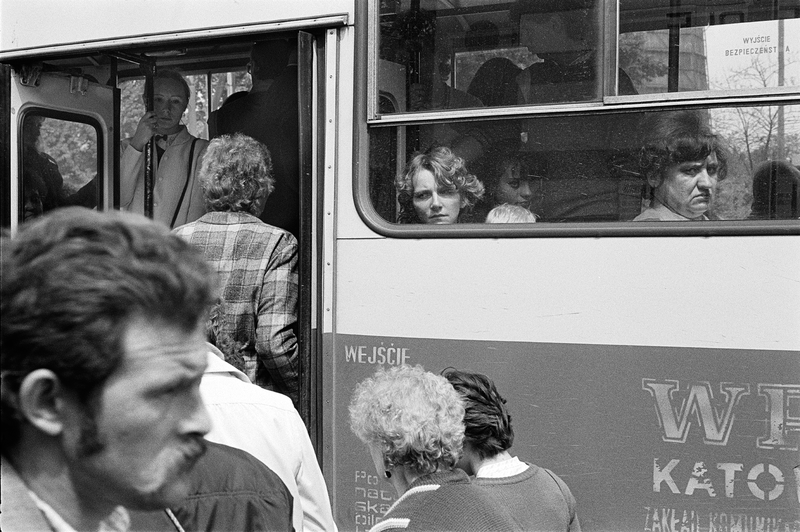 Warsaw, Poland, June 1987. 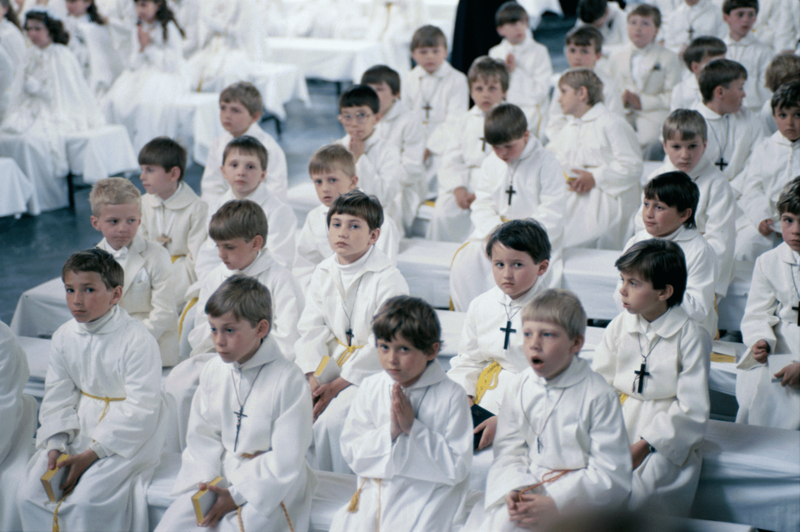 Pope John Paul II visits Poland. 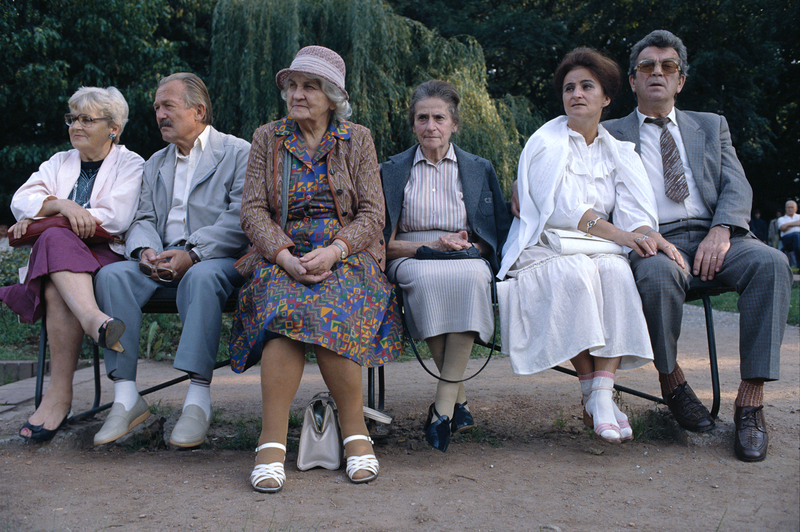 Gdańsk, Zaspa, Poland, June 12, 1987. Pope John Paul II visits Poland. The Polish church supported by the Polish Pope, John Paul II (Karol Józef Wojtyła, 1920-2005) in Rome, became the centre of resistance against the communist regime in Poland. 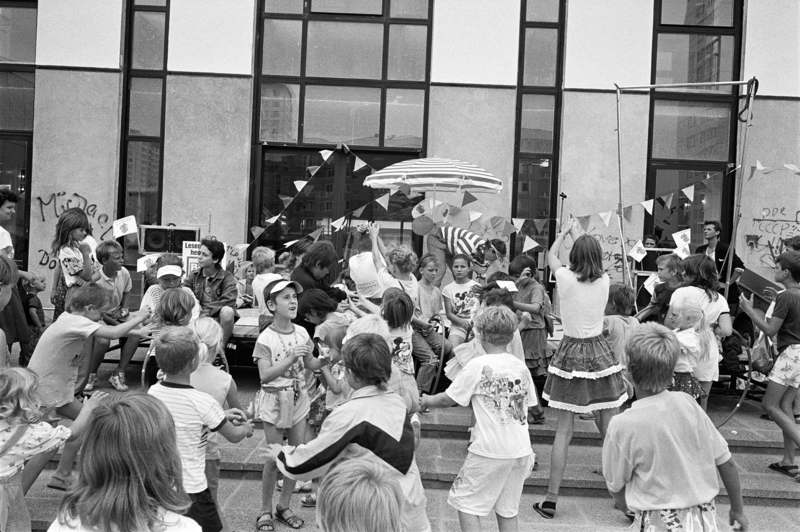 Gdańsk, Zaspa, Poland, June 12, 1987. 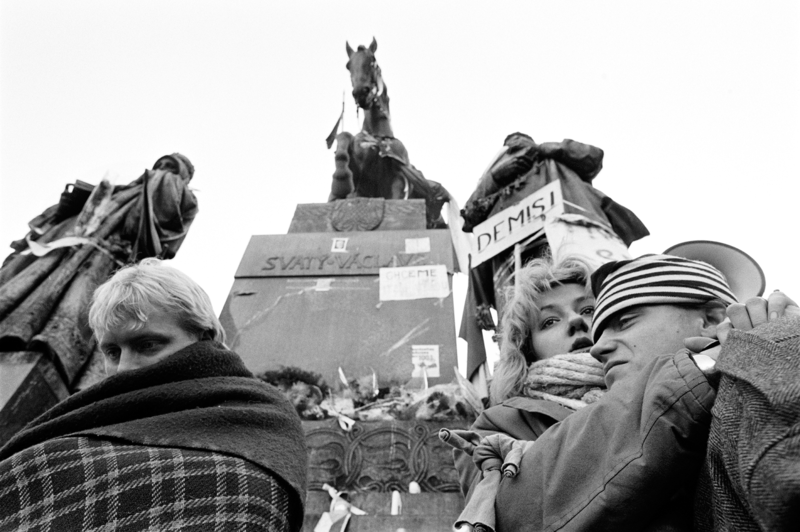 The Hague, The Netherlands, December 22, 1989. 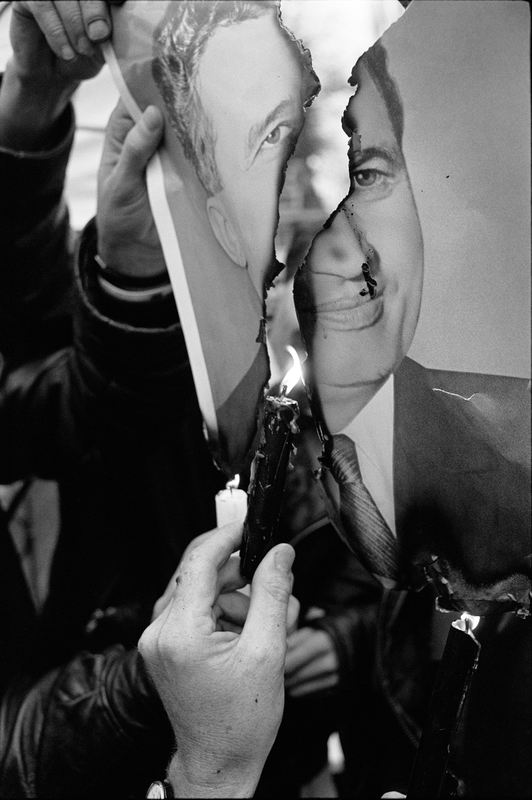 In front of the Romanian embassy in The Hague, a portrait of Nicolae Ceauşescu (1918-1989) is burned by Romanian protestors. That day in Romania he would be removed from office during an uprising against his regime. Ceauşescu was General Secretary of the Romanian Communist Party from 1965 to 1989. He was executed together with his wife Elena (1916-1989) on December 2, 1989. 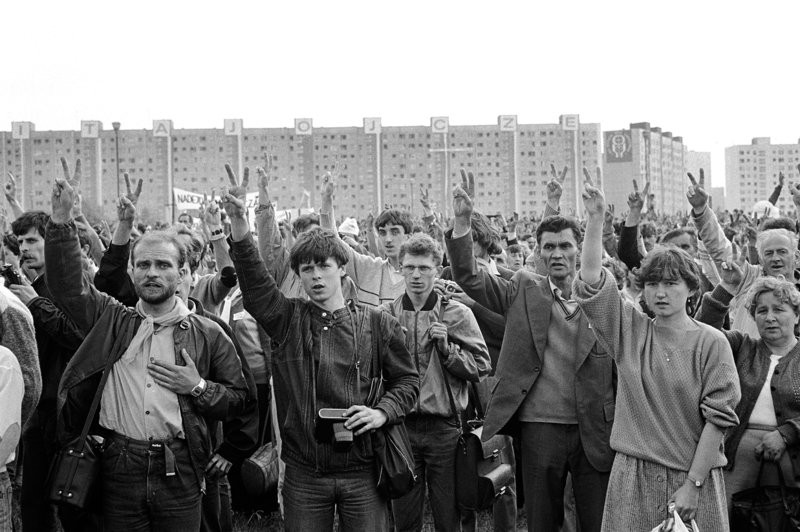 Berlin, Germany, 1990. The Berlin Wall was demolished after the East German government had announced on November 9, 1989 that all GDR citizens could visit West Germany and West Berlin. In the period that followed tourists took the opportunity to hammer pieces from the Wall as a souvenir. 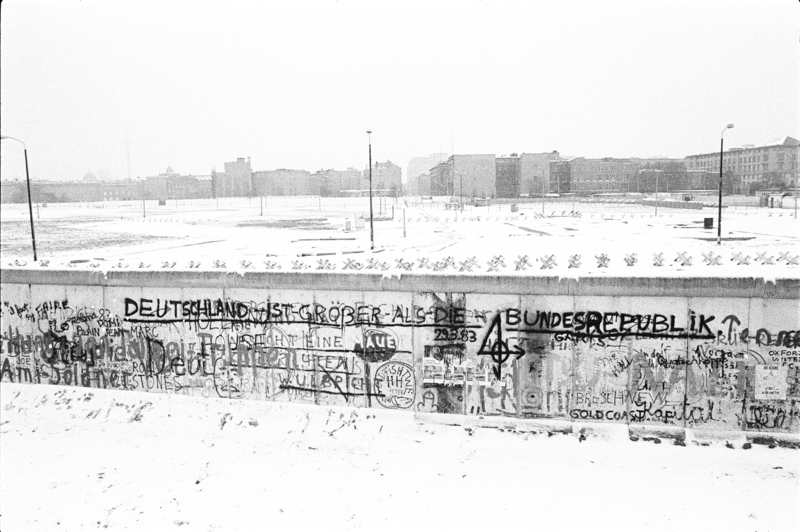 The Wall was torn down in the months after a press conference given by Günter Schabowski (1929), party boss in East Berlin and the spokesman for the SED Politburo on November 9, 1989. He answered a question by a journalist who asked when new regulations would take effect. Reading a note he just received he said: As far as I know … effective immediately, without delay. 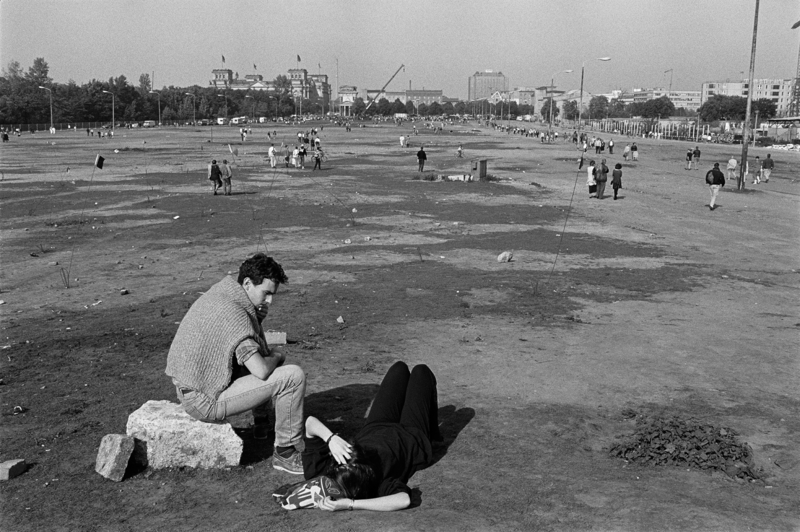 That night thousands of GDR citizens crossed the border to West Berlin. As far as I know ... effective immediately, without delay. 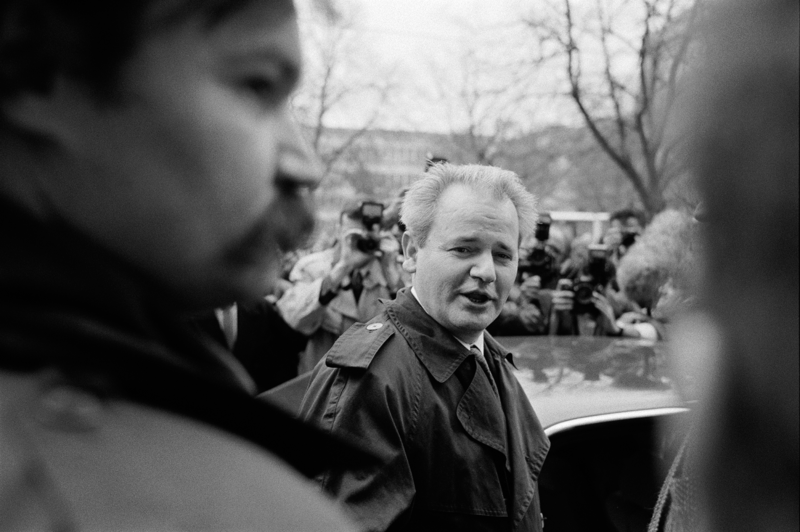 Günter Schabowski November 9, 1989. 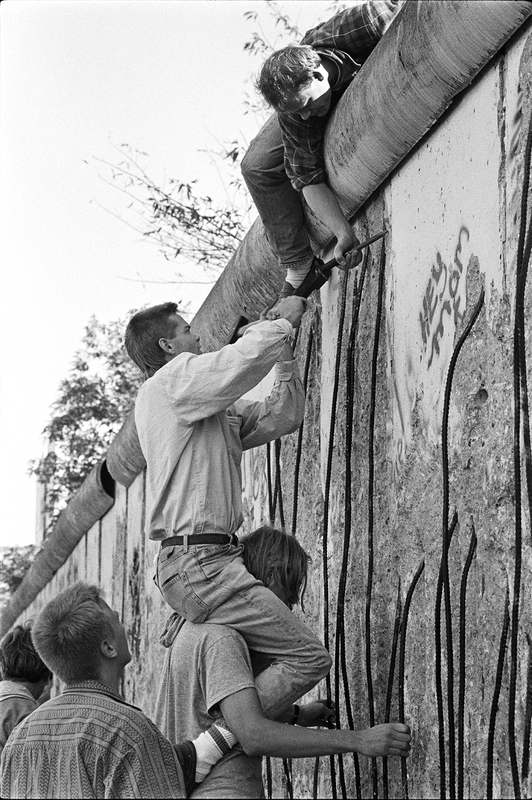 Berlin, Germany, October 3, 1990. Riot police outside the Reichstag, the German parliament, on the day of the German reunification. That day the German Democratic Republic (GDR) joined the Federal Republic of Germany (BRD), and Berlin reunited into a single city. The Germans speak of “der Wende” (The Turning Point). 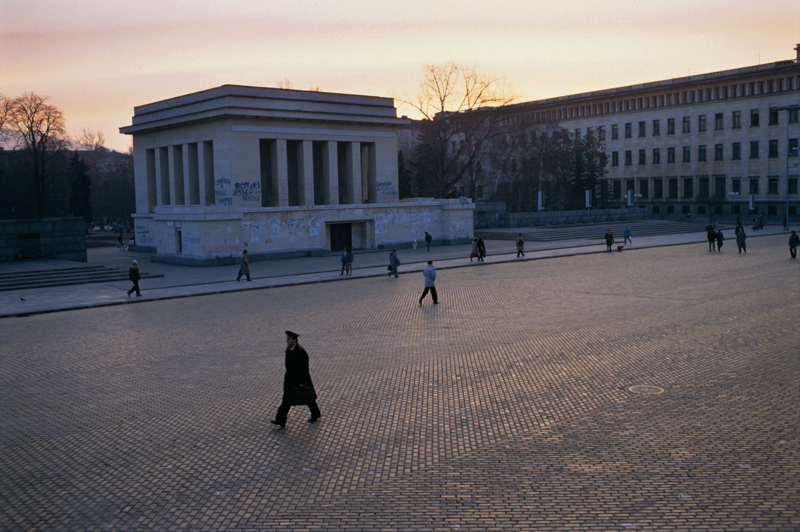 Berlin, Germany, 1990. When the Berlin Wall was built in 1961 The Potsdamer Platz was divided in two parts leaving lots of empty space on both sides. In between there was a no mans land full of mines. 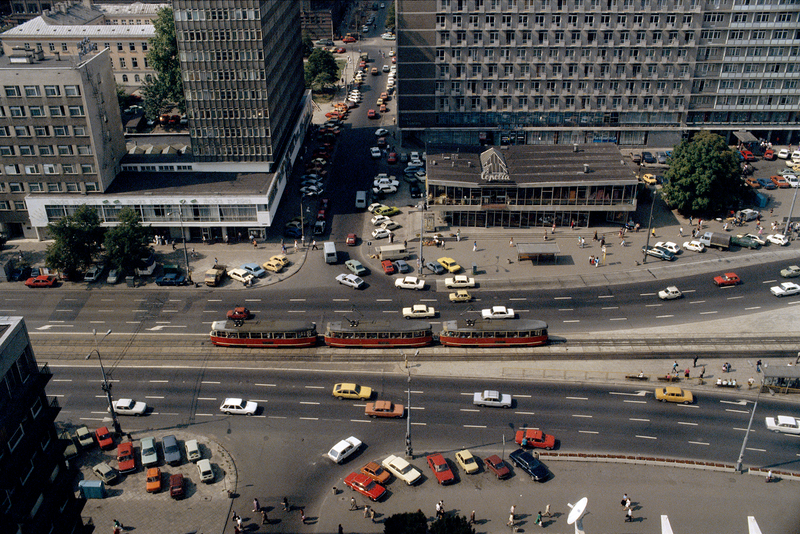 After the turning point (die Wende) the Potsdamer Platz became a prominent centre in the city and a target of investment speculation. 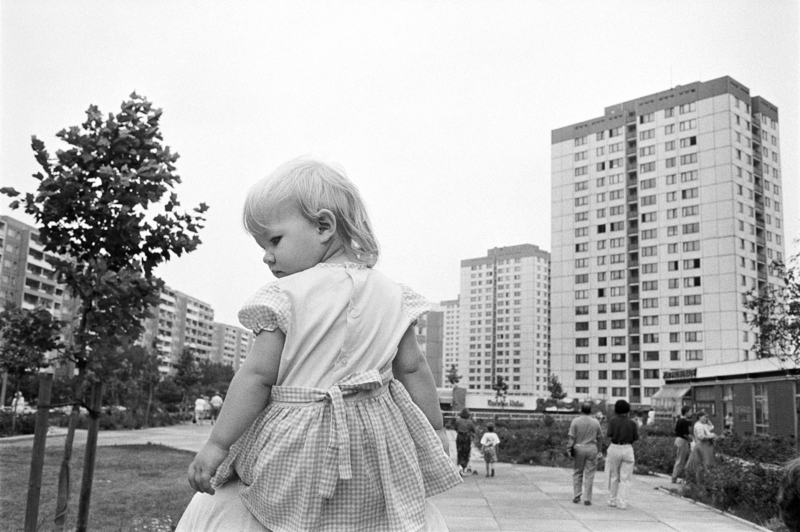 Leipzig, Germany, 1991. Karl Marx Square (now again Augustusplatz). 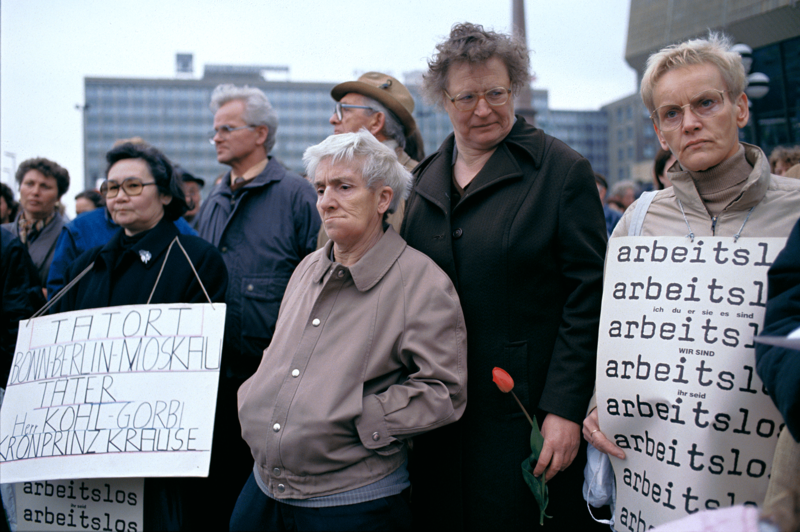 Protest against unemployment in the Eastern part of the unified Germany. 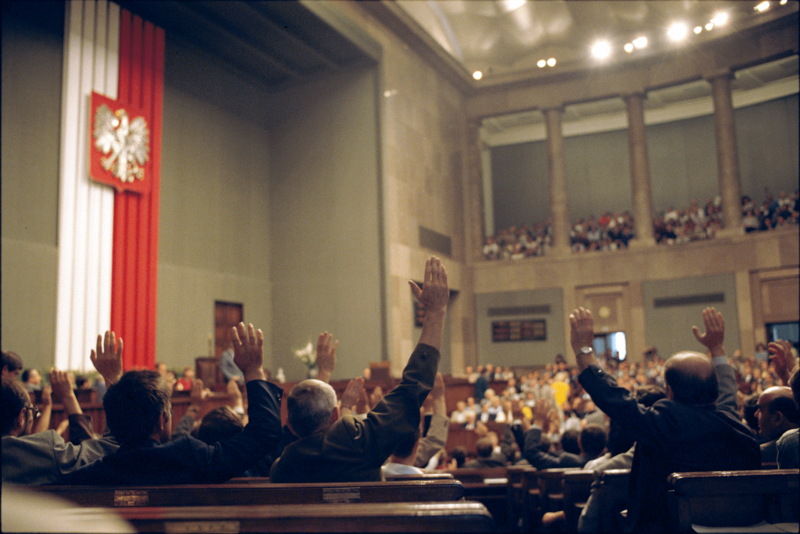 The protest meetings on Monday evenings after the weekly Friedensgebet (prayer for peace) in the Nikolaikirche in Leipzig preceded the turning point (die Wende) 1989. 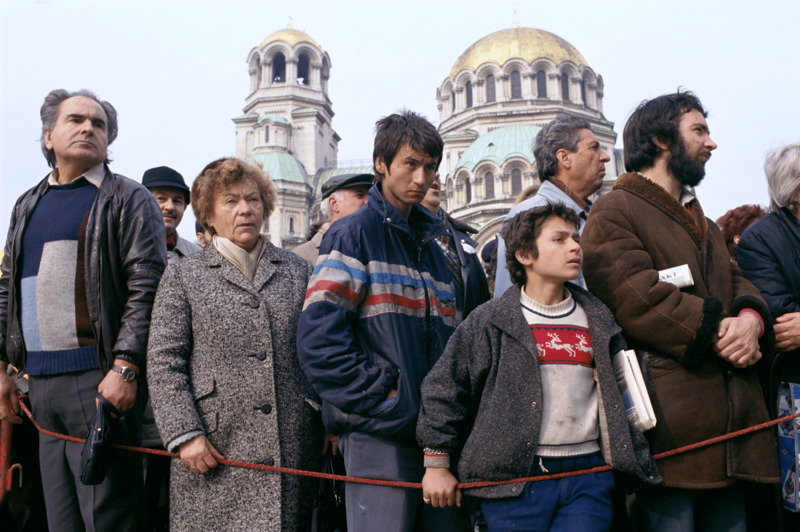 Sofia, Bulgaria, 1991. 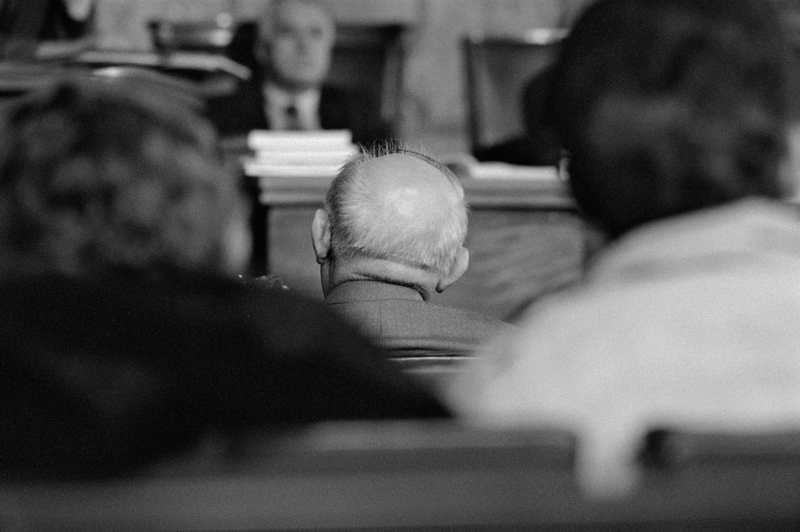 Trial against former ruler Todor Zhivkov (1911-1998). Zhivkov was the First Secretary of the Communist Party and later head of state of the People’s Republic of Bulgaria from 1954 to 1989. He resigned as First Secretary on November 10, 1989. By January 1990 he was removed from the Bulgarian Communist Party and was arrested on a number of fraud and nepotism charges. Two years later he was convicted of embezzling government funds and sentenced to seven years in prison. Due to old age he was allowed to serve his term under house arrest. He was eventually acquitted by the Bulgarian Supreme Court in 1996. 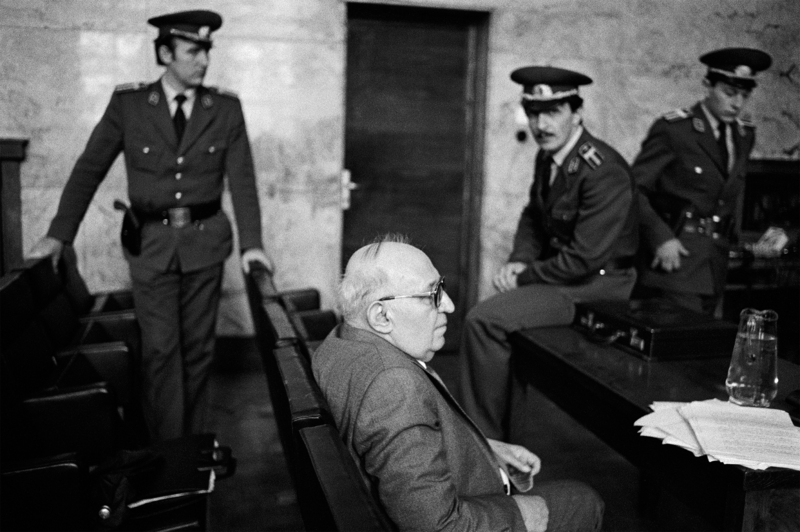 After his death in 1998 all convictions against Todor Zhivkov were reversed. Warsaw, Poland, 1990. View from the top floor of the Marriott Hotel. Warsaw, Poland, August 22, 1989. 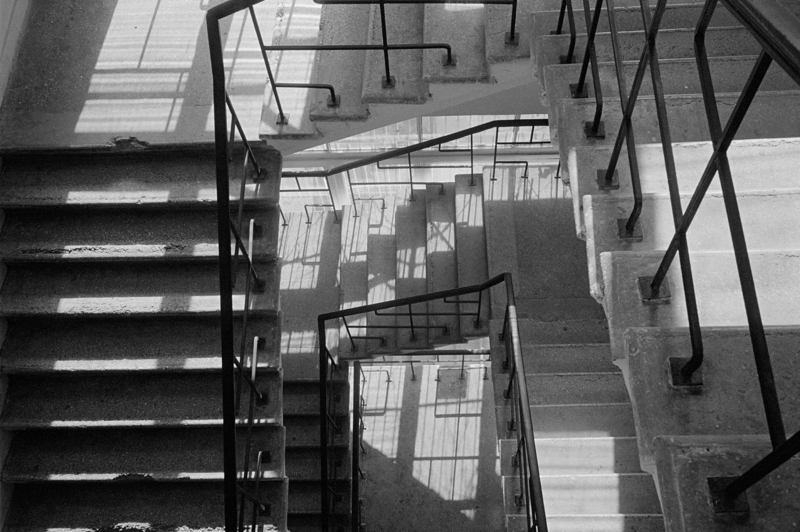 The Solidarity newspaper Gazeta Wyborcza’s editing room is based in a former kindergarten. 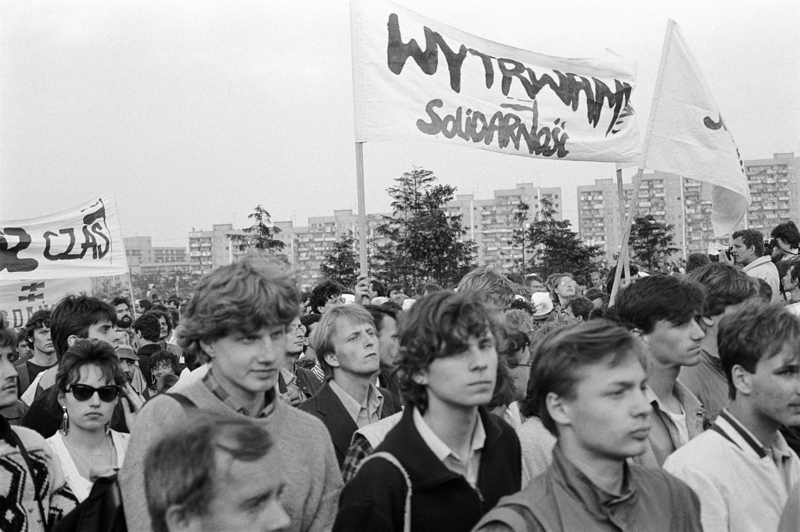 On May 8, 1989 Gazeta Wyborcza’s (Election Newspaper), was founded to serve as the voice of the Solidarity movement during the run-up to semi-free elections to be held June 4, 1989. It was the first legal newspaper published outside the communist government’s control since 1945. Adam Michnik has been editor in chief since the start. Warsaw, Poland, August 17, 1989. Fraction of the Solidarity Party in the Sejm, the Polish parliament. Many of them served prison terms for political reasons during communist rule. Jan Lityński (1946), in prison for two years, Adam Michnik (1946), in prison for six years, Mieczysław Gil, (1944) in prison for one year, Henryk Wujec (1940), in prison for six years, Bronisław Geremek (1932-2008), in prison for two years and Jacek Kuroń (1934-2004), in prison for seven years. Solidarity (Solidarność) started as a trade union that emerged on August 31, 1980 at the Gdańsk Shipyard under the leadership of Lech Wałensa (1943). 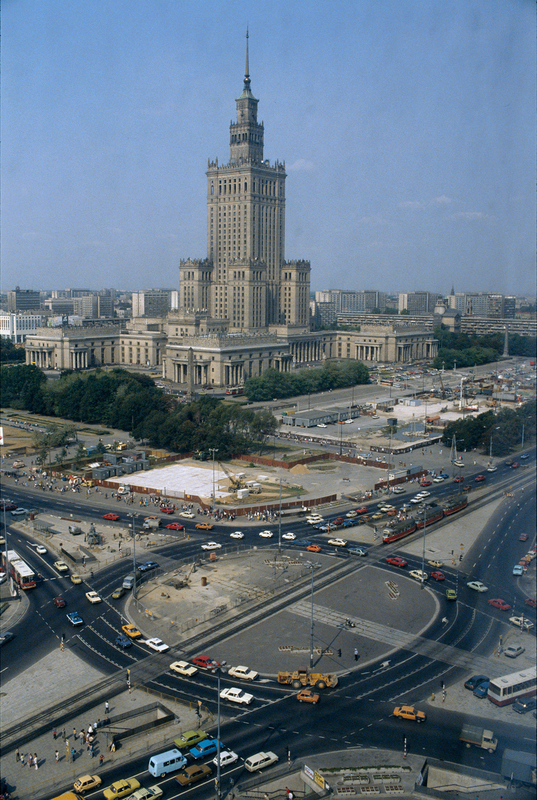 It was the first non-communist party controlled trade union in a Warsaw Pact country. (The Warsaw Pact, was a defense treaty between seven communist states of Eastern Europe and the Soviet Union in existence during the Cold War from 1955 until 1991, when the Soviet Union was dismantled). In the 1980s, Solidarity was a broad social movement, using the methods of civil resistance to advance the causes of workers’ rights and social change. 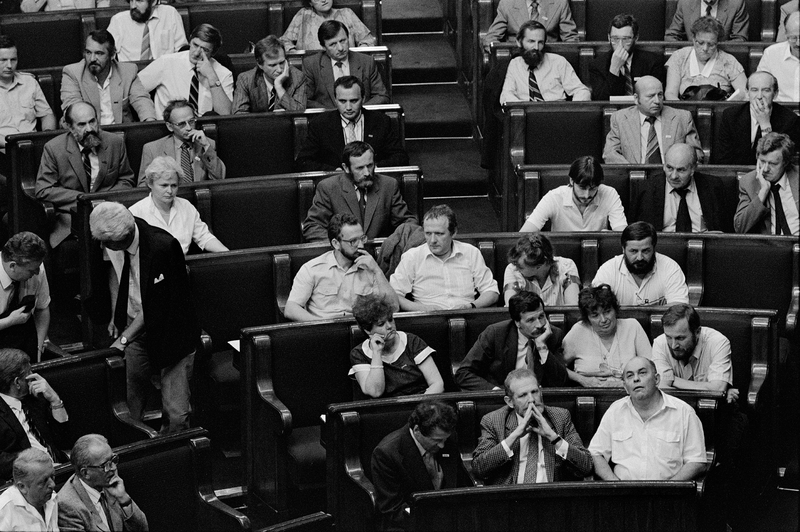 The “Round Table Talks” between the government and the Solidarity-led opposition led to semi-free elections in 1989. The elections were won by Solidarity with an overwhelming majority. Warsaw, Poland, 1989. In the Sejm, the Polish parliament, behind the seat of President General Witold Jaruzelski, Tadeusz Mazowiecki is waiting for the results of the vote. Warsaw, Poland, August 24, 1989. 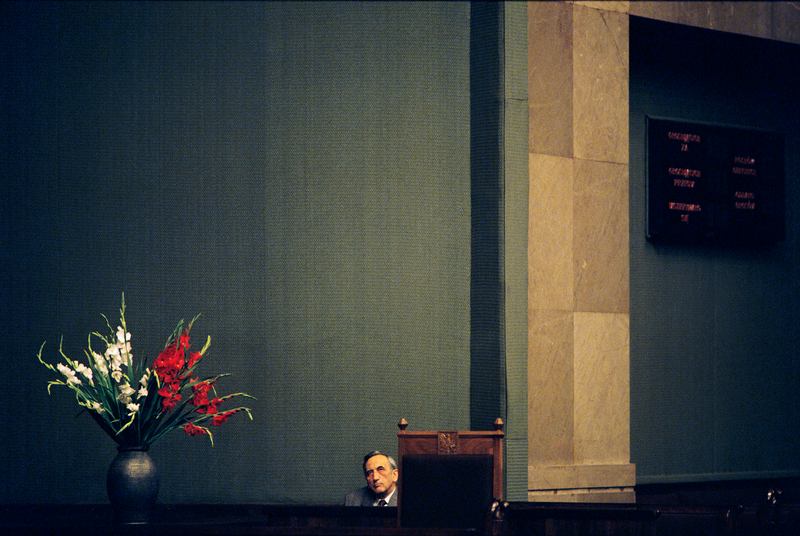 The Sejm, the Polish parliament is voting Tadeusz Mazowiecki (1927-2013), representing the Solidarity-led movement, to become the first non-communist prime minister in Central and Eastern Europe since 1945. After martial law was proclaimed in Poland by General Witold Jaruzelski on 12 November 1981, Tadeusz Mazowiecki was sent to prison during communist rule from December 1981 to December 1982. Warsaw, Poland, 1990. 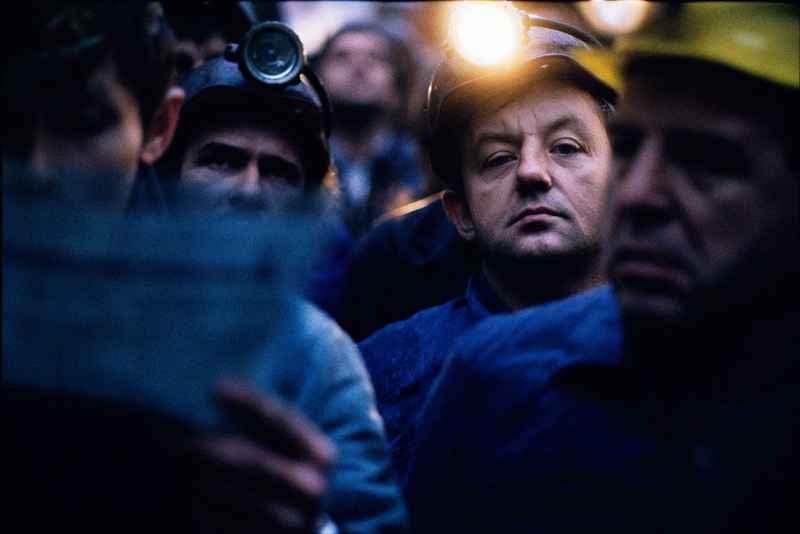 Outside the Sejm, miners from Silesia protest against the Mazowiecki government. They demanded guaranteed jobs and higher wages. 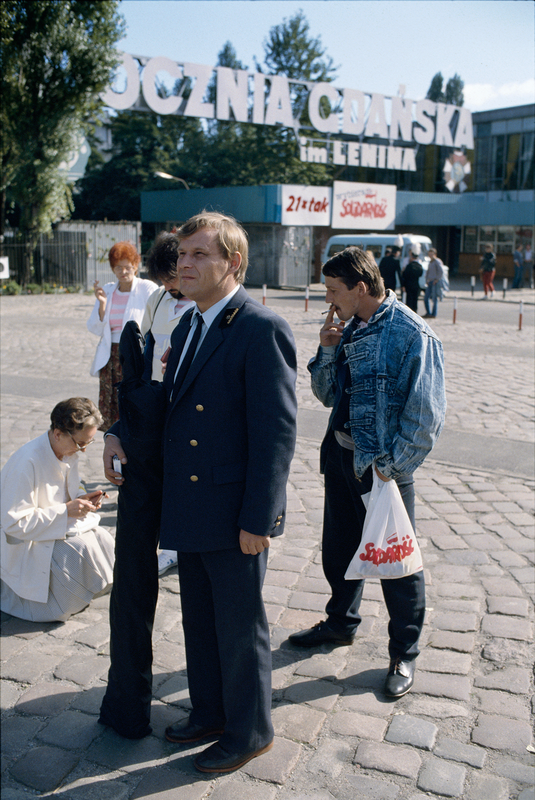 Gdańsk, Poland, 1990. At the gate of the Gdańsk Shipyard, situated on the left side of Martwa Wisła and on Ostrów Island. The yard gained international fame when Solidarity, the first free trade union in post war Eastern Europe and centre of the Polish opposition against the communist rule, was founded there in 1980. 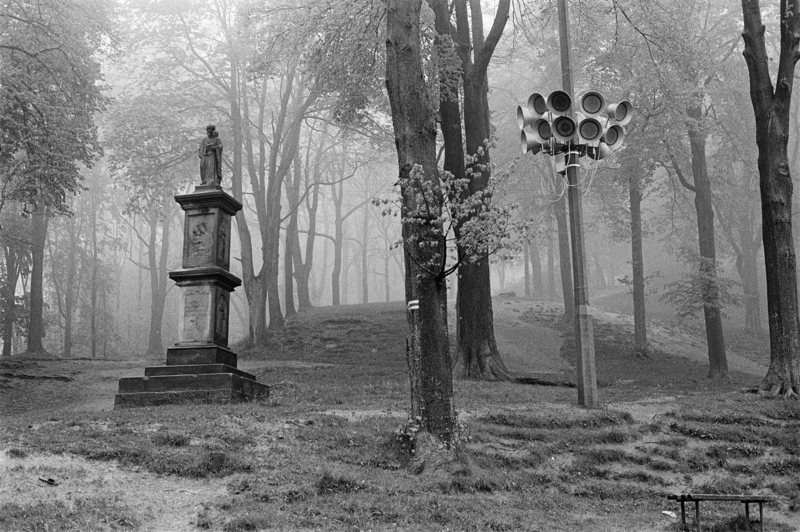 Opole, Poland, 1990. Lech Wałęsa (1943) leader and co-founder of Solidarity, campaigning to be elected as president of Poland. Wałęsa started his career as an electrician at the Gdańsk Shipyard where Solidarity was born. 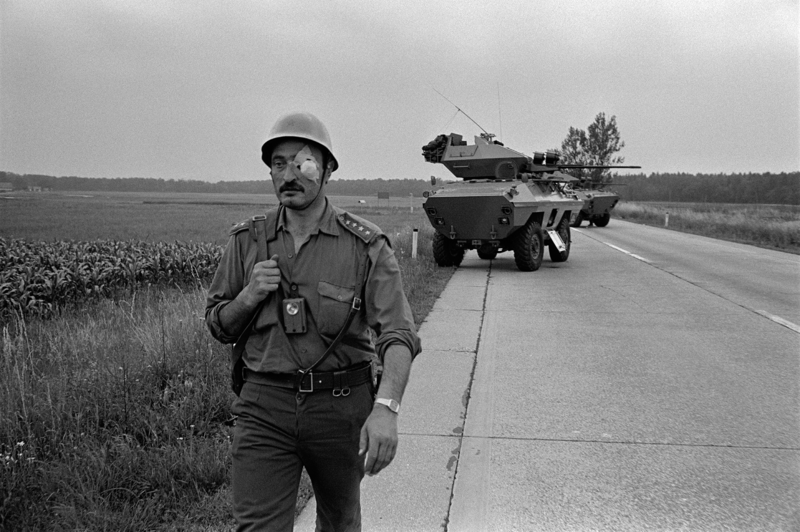 He was arrested under the Martial Law proclaimed by his predecessor Witold Jaruzelski on 12 December 1981. Wałęsa was in prison until October 1982. In 1983 he won the Nobel Peace Prize, but was not given permission to travel to Norway to collect it. His wife went instead. In 1989 he and his fellow Solidarity members were invited by the communist rulers to join the “Round Table Talks” that led to semi-free elections in 1989 and transformation to democracy in 1990. He would be the first free elected president of Poland since WWII. Lech Wałęsa was president of Poland between 1990 and 1995. Warsaw, Poland, 1990. 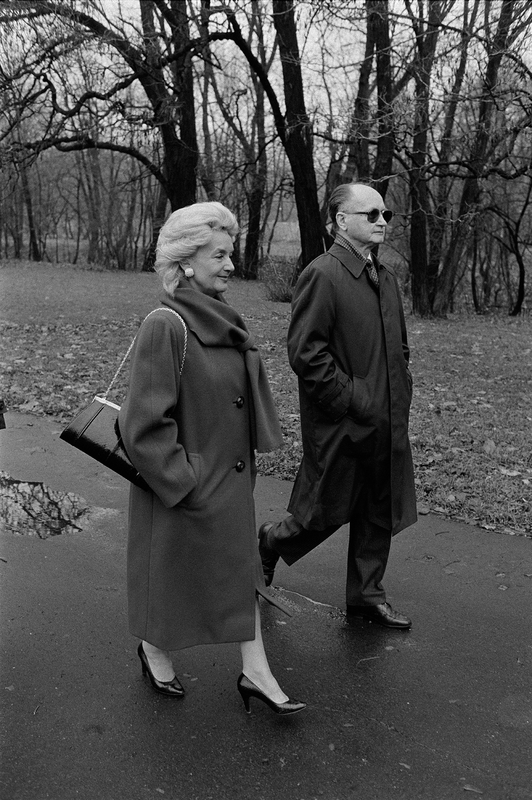 General Wojciech Jaruzelski walks to the polling station with his wife Barbara to vote for his successor. Wojciech Witold Jaruzelski (1923-2014) was the last сommunist leader of Poland from 1981 to 1989, Prime Minister from 1981 to 1985 and head of state from 1985 to 1990. 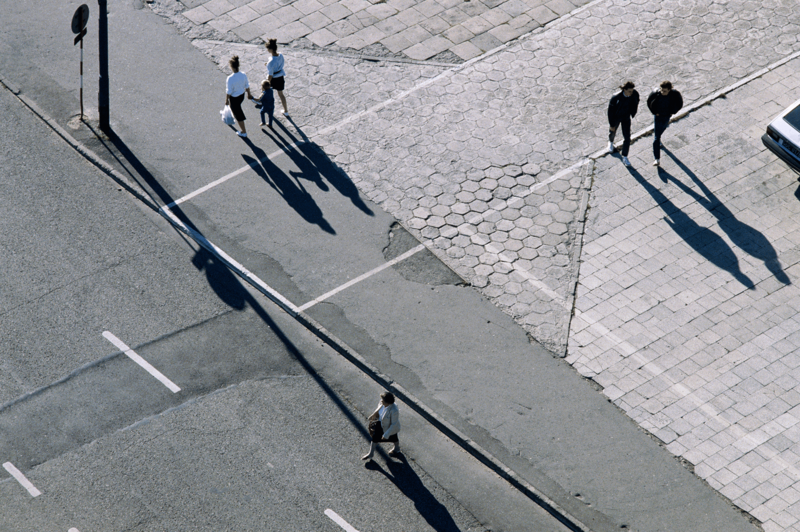 Warsaw, Poland, September, 1989. 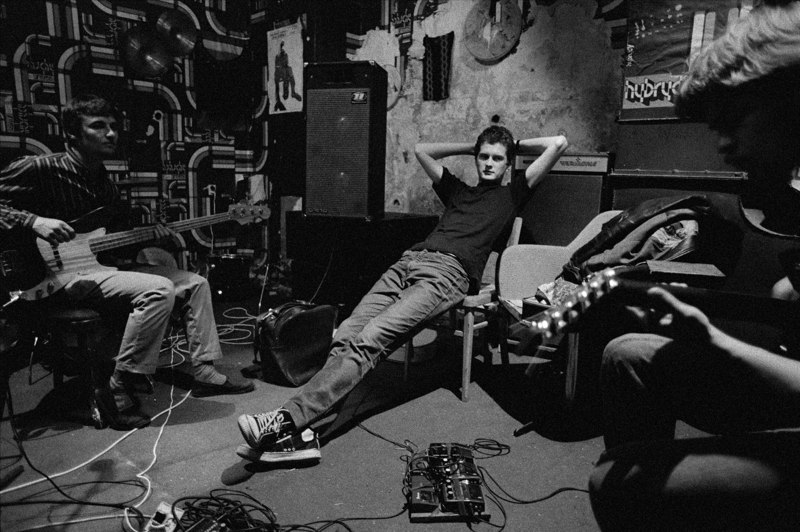 Poland’s most prominent punk band Dezerter in their rehearsal basement. 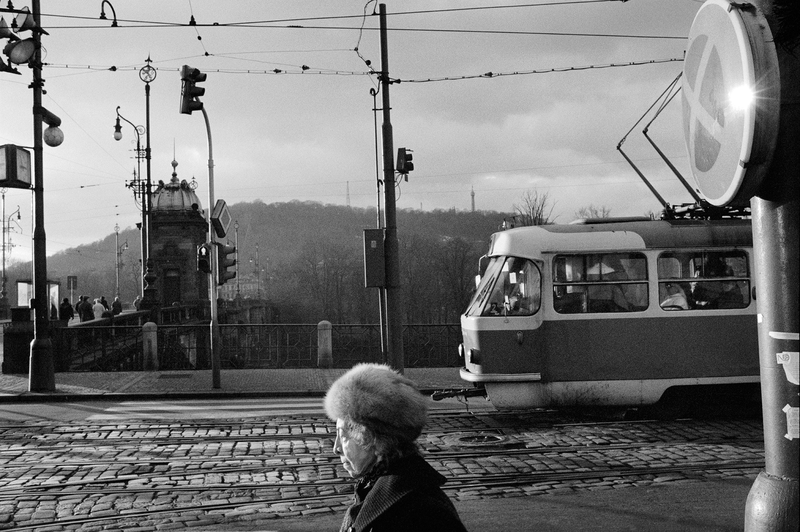 Prague, Czechoslovakia, November 1989. The window of barbershop Hygie shows a portrait of Gorbachev to announce the 72nd anniversary celebrations of the Bolshevik October Socialist Revolution: Rebuilding is a revolutionary result of Socialism. Next to it: Hygie is with you and goes with you on the day of the General Strike. (A two hour national general strike was held on November 27.) Another note says: Come with us and support the Civil Forum. 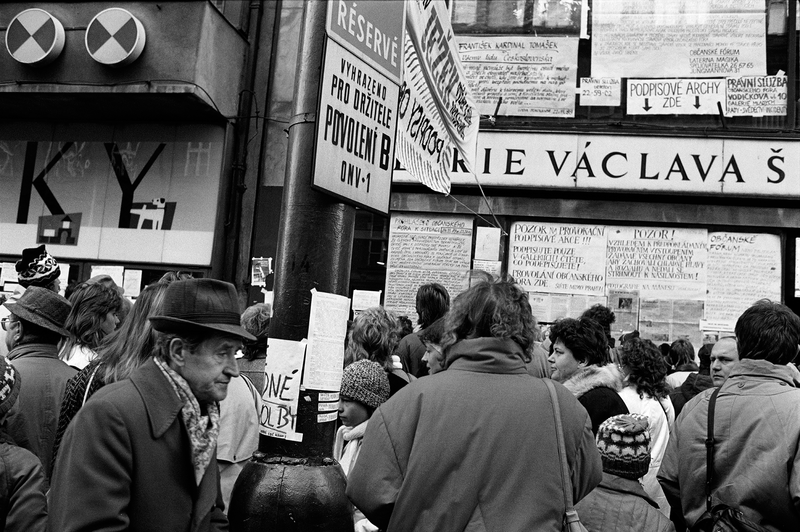 Prague Czechoslovakia, Wenceslas Square, November 1989. 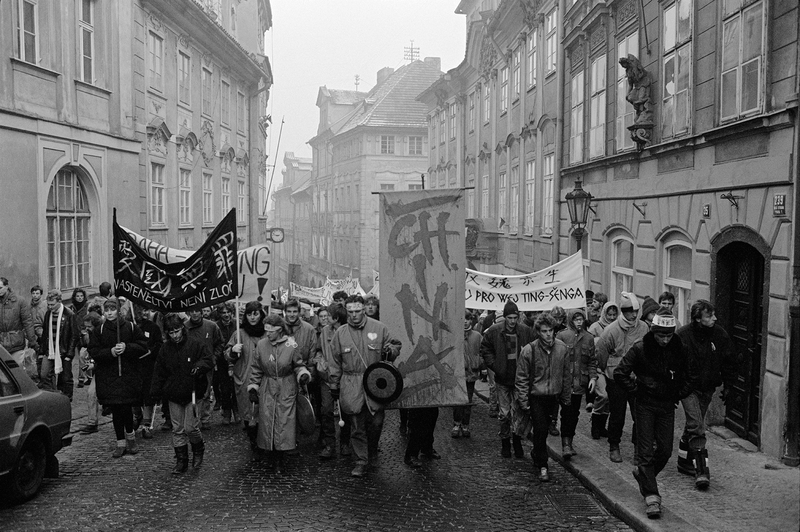 Protesters against the communist regime carry a portrait of Alexander Dubček, former communist party chairman who was forced to resign during the Warsaw Pact intervention in Czechoslovakia in 1968. Prague Czechoslovakia, November 1989. 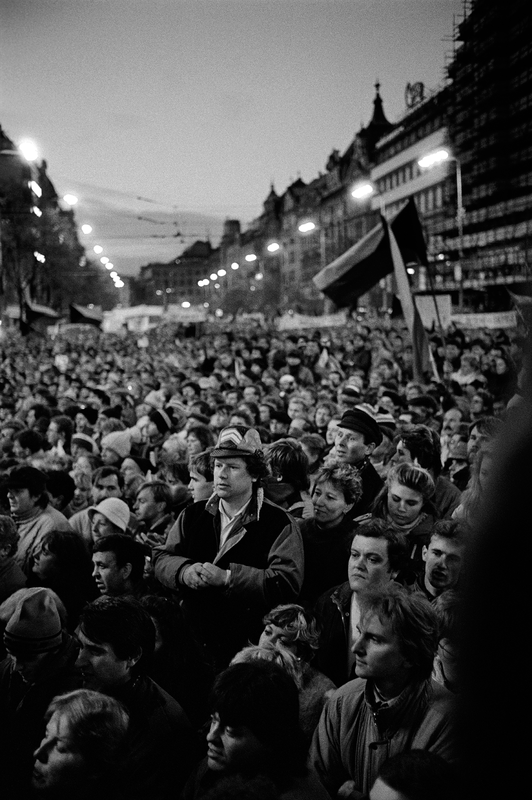 Thousands of protesters against the communist regime gather at Wenceslas Square. Prague, Czechoslovakia, November 1989. 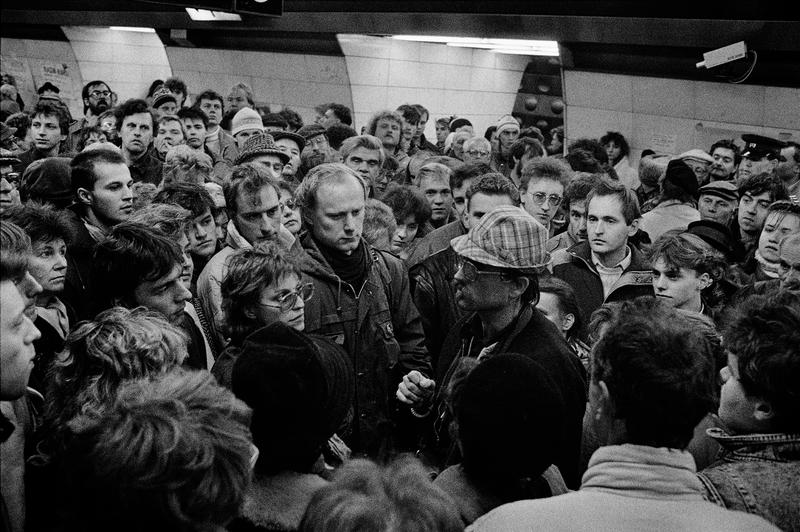 People discuss politics at a metro platform. 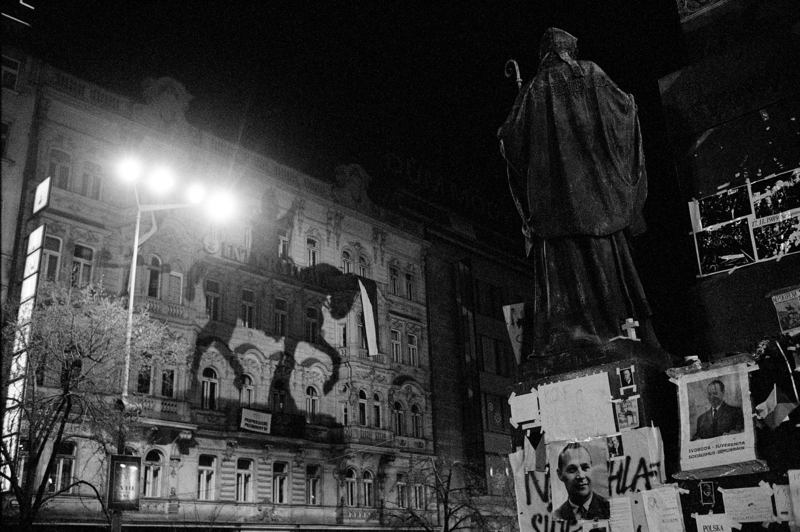 Prague, Czechoslovakia, November 1989. 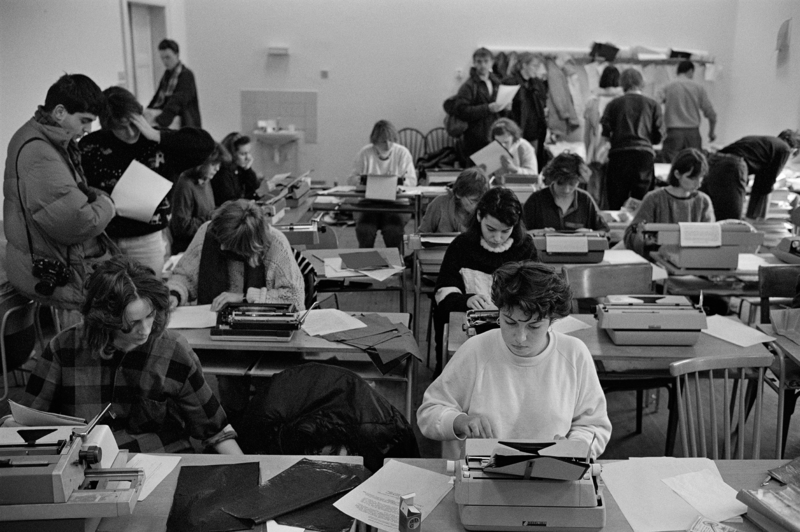 Students who were a major force during the “Velvet Revolution”, spread cartoons making fun of the Komunistická strana Československa (KSČ), the Czechoslovakian Communist Party. 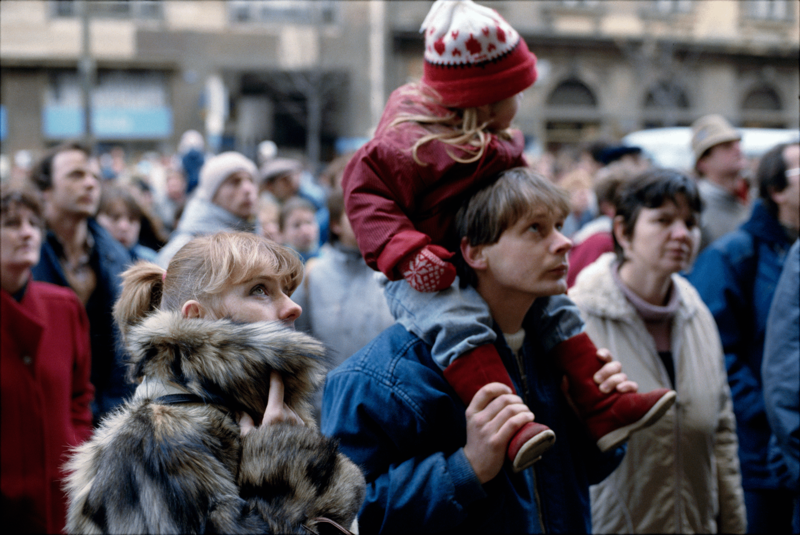 Prague, Czechoslovakia, November 1989. Wenceslas Square. 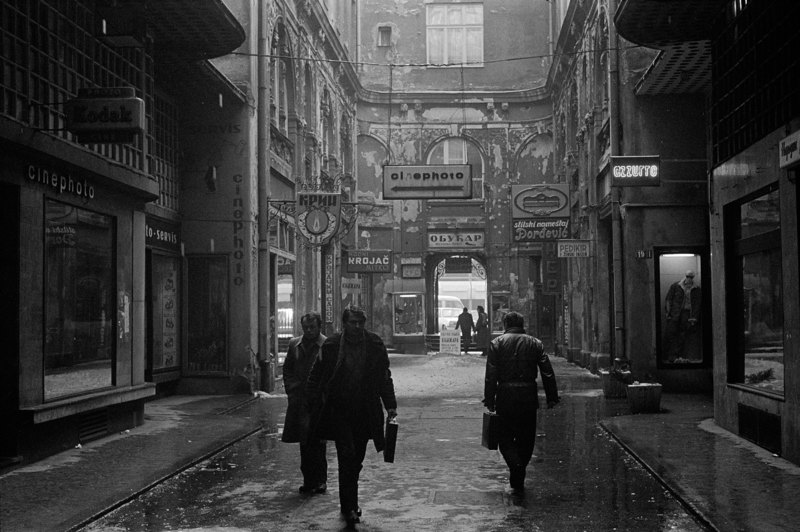 Prague, Czechoslovakia, 1989. Students occupy Prague University. 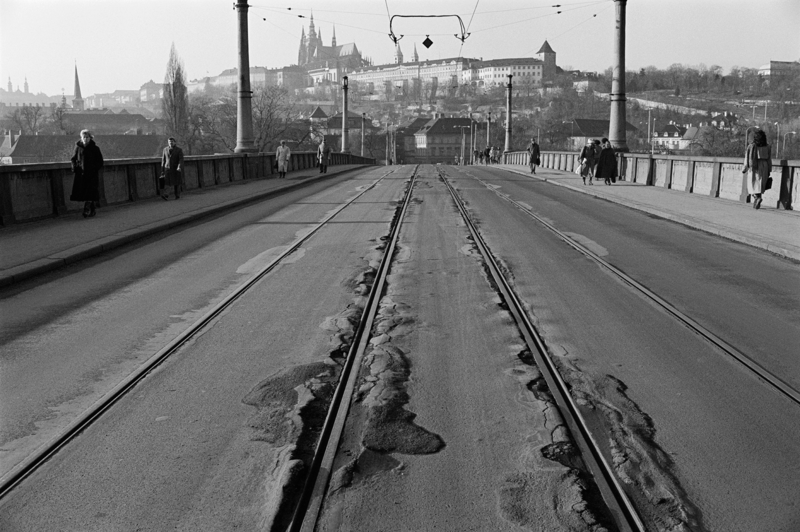 Prague, Czechoslovakia, November 1989. Wenceslas Square, statue of Saint Wenceslas, the patron saint of Bohemia covered, as it also was during the Prague Spring of 1968, with pamphlets, slogans and pictures of Alexander Dubček and Tomáš Masaryk (1850-1937) the founder and first President of Czechoslovakia. Prague, Czechoslovakia, 1989. Friday, November 24 1989. 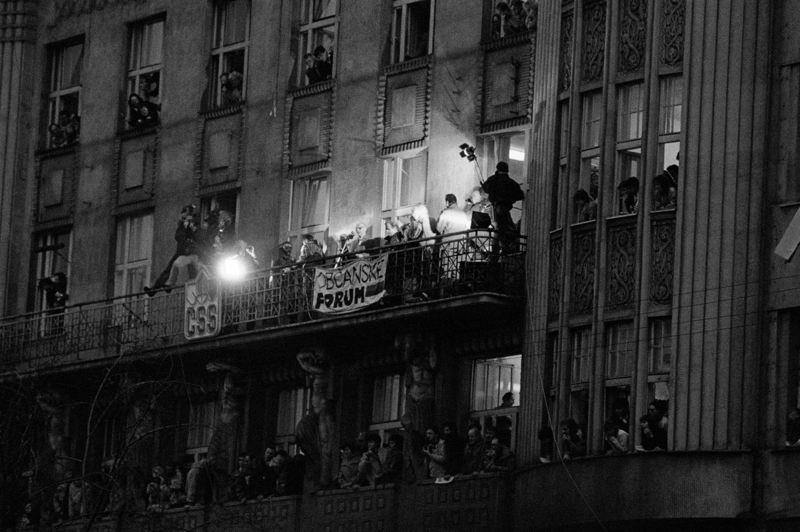 Václav Havel, Alexander Dubček and other members of the Civic Forum address the crowds at Wenceslas Square from the Melantrich Balcony, Václavské náměstí 36, the building that housed the Melantrich publishing house and the Socialist Party newspaper, Svobodné Slovo. The building now houses a branch of Marks & Spencer. 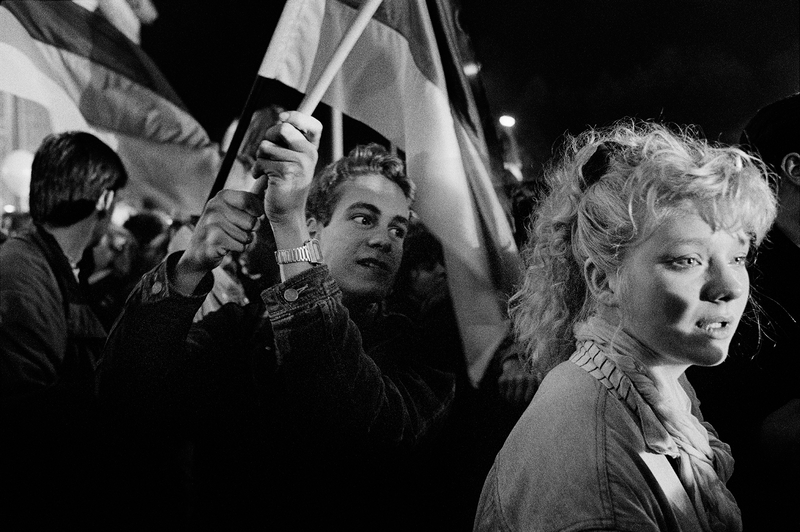 Prague, Czechoslovakia, Friday, November 24, 1989. 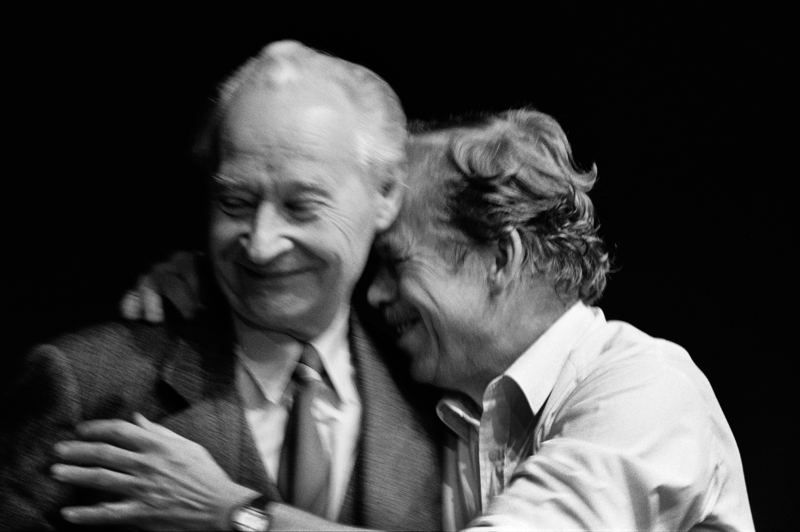 In the Laterna Magika theatre Alexander Dubček and Václav Havel embrace after hearing that the entire Presidium, including General Secretary Miloš Jakeš, had resigned. Václav Havel (1936-2011) was a playwright, essayist, poet, dissident, politician and above all the symbol of resistance against the communist rule in Czechoslovakia for decades. He would become the first free elected post-war President of Czechoslovakia and the Czech Republic after the separation of the two states in 1992. He would be President of the Czech Republic till 2003. Alexander Dubček (1921-1992) was a Slovak politician and leader of Czechoslovakia from 1968 to 1969. His attempt to reform the communist society during the Prague Spring failed. 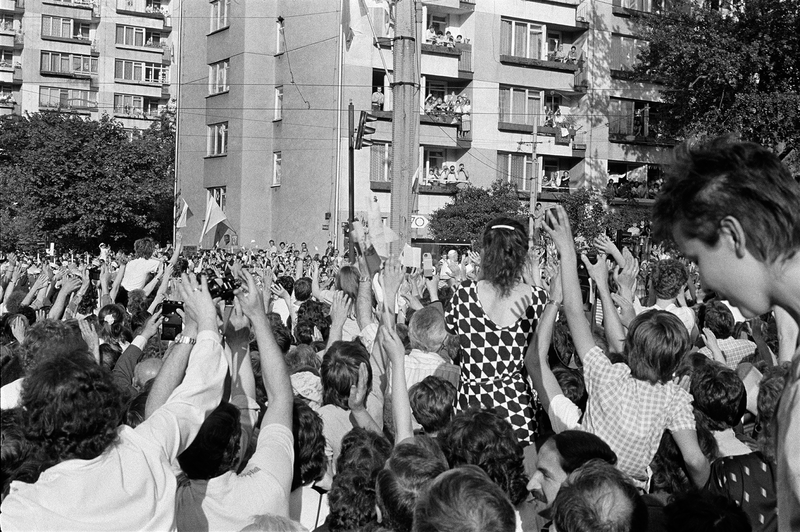 On the night of August 20 – 21 1968, Soviet (Warsaw Pact) forces entered Czechoslovakia. The occupying armies seized control of Prague and the Central Committee’s building, taking Dubček and other re-formers into custody. 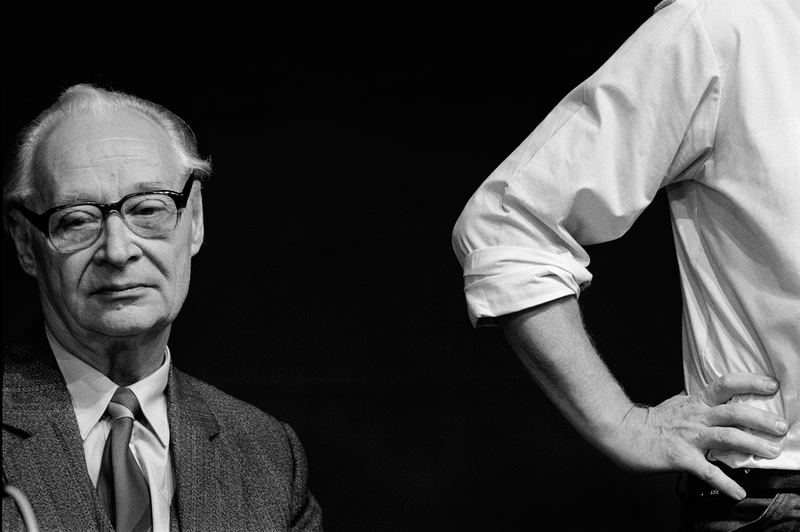 Dubček was forced to resign as First Secretary in April 1969. 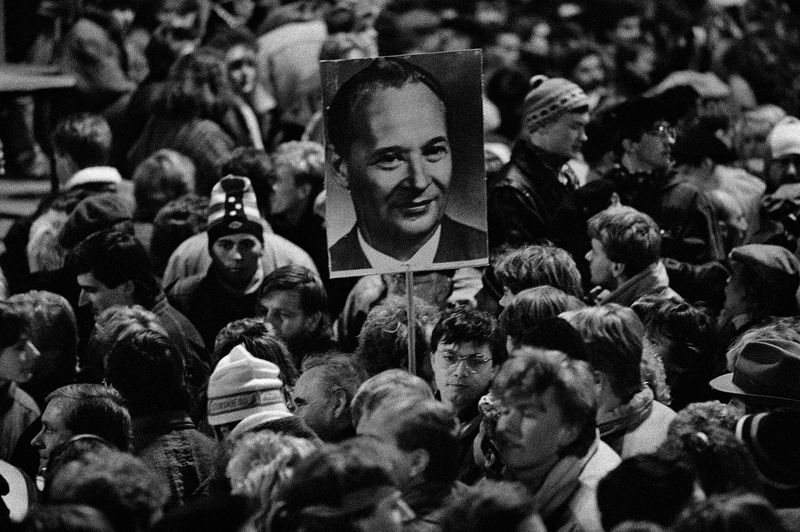 After the “Velvet Revolution” in 1989, Alexander Dubček became Chairman of the federal Czechoslovak parliament. He died in a car crash in 1992. 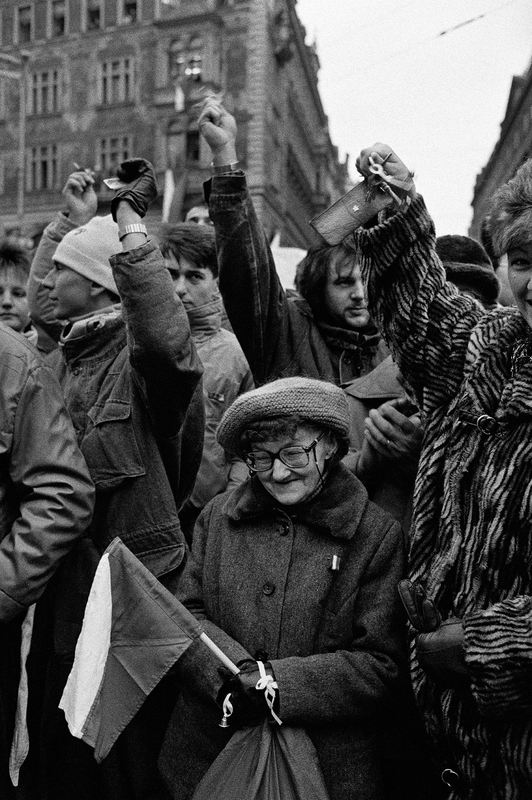 The “Velvet Revolution” was a non-violent revolution in Czechoslovakia that took place from November 17 to December 29, 1989 against the one-party government of the Communist Party of Czechoslovakia. It caused the collapse of the party’s control of the country. The opposition movement of various directions were organized in the Civic Forum. Together they were able to organise a mass protest forcing the communist rule to resign. Students played an important role in the organisation. They were able to communicate to the masses by spreading thousands of notes, often hand written, all over the city of Prague. 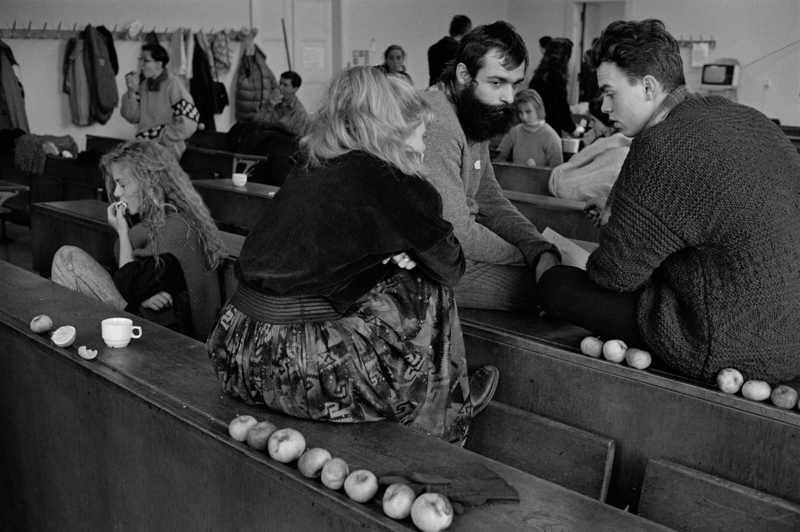 Prague, Czechoslovakia, Sunday, November 26, 1989. 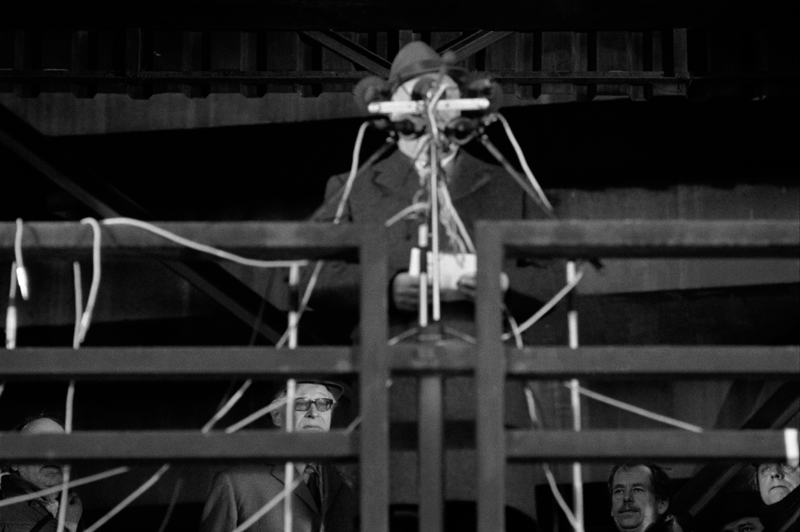 At the Prague-Letná Park outgoing Prime Minister Ladislav Adamec addresses the crowds, while Václav Havel and Alexander Dubček are patiently waiting. 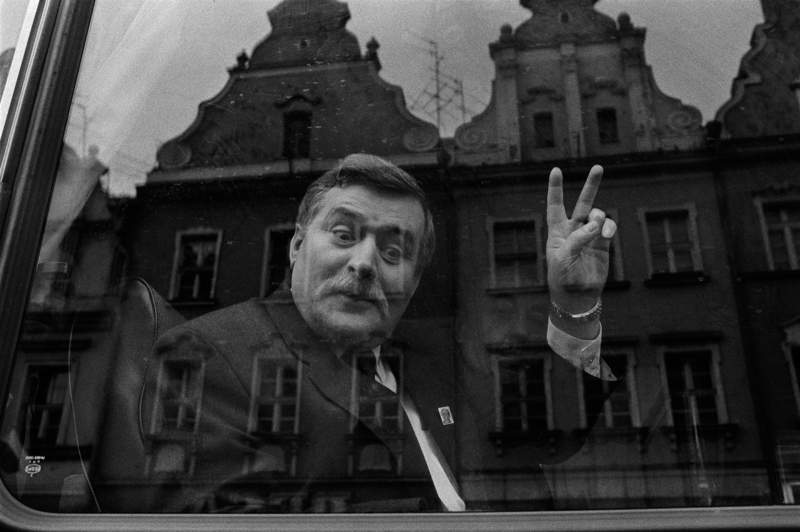 Ladislav Adamec (1926-2007) was the last сommunist leader of Czechoslovakia. He served from October 12, 1988 to December 7, 1989. Prague, Czechoslovakia, 1989. Students who just participated in the successful “Velvet Revolution” march in solidarity with the protesters in Beijing, China where on June 4, 1989, demonstrations in and near Tiananmen Square were violently crushed by the Chinese army. Zagreb, Croatia, June 2, 1991. President Franjo Tuđman (1922-1999) declares independence and dissolution of its association with Yugoslavia in the Croatian Parliament. 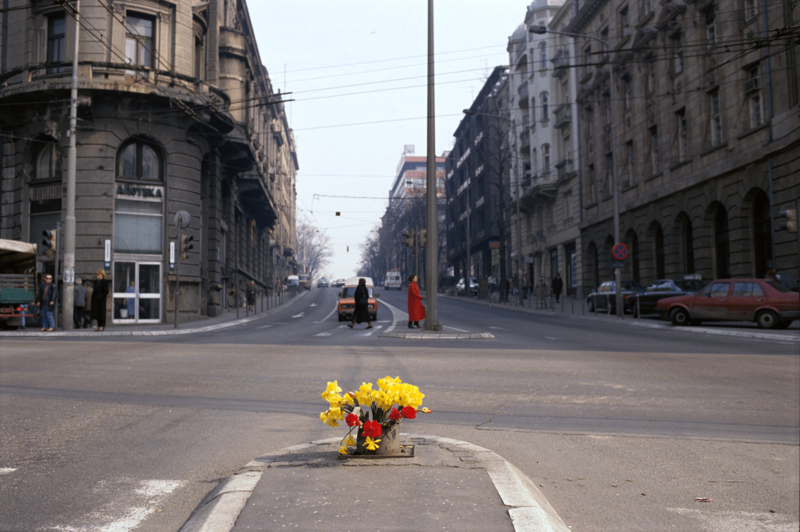 Belgrade, Serbia, 1991. Slobodan Milošević (1941-2006) served as the President of Socialist Republic of Serbia and Republic of Serbia from 1989 until 1997 in three terms and as President of the Federal Republic of Yugoslavia from 1997 to 2000. 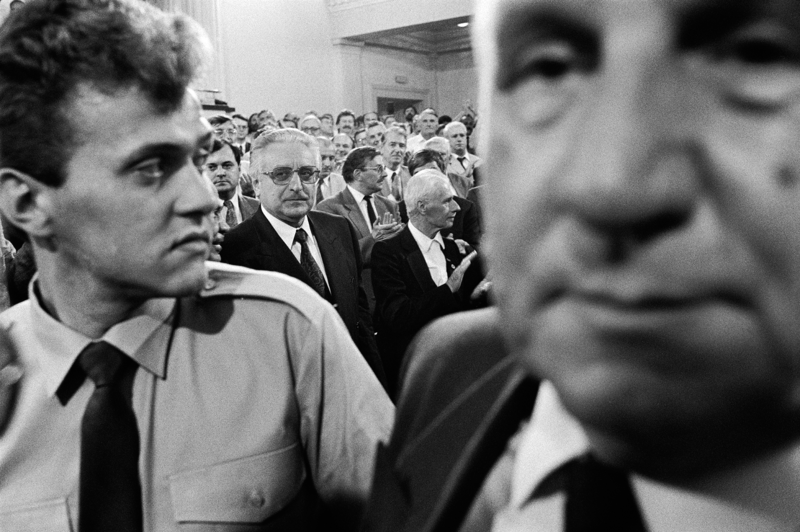 His presidency was marked by the breakup of Yugoslavia and the subsequent Yugoslav wars. He died in a prison cell in Scheveningen, the Netherlands, in 2006. 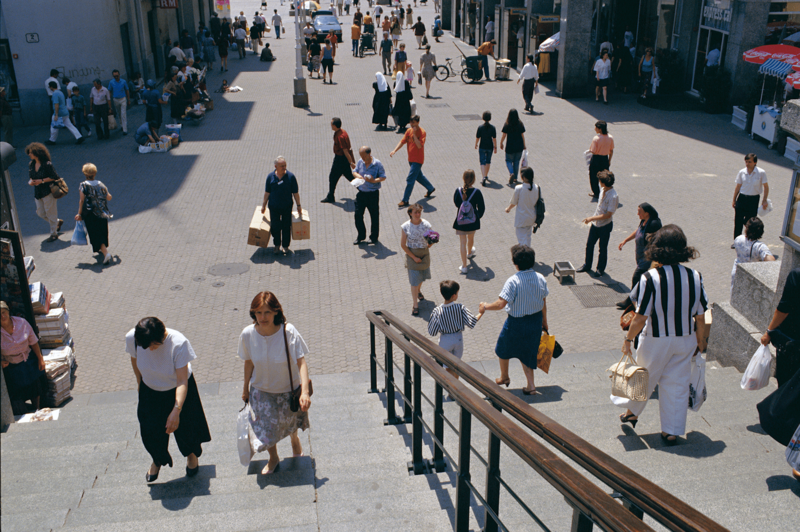 Ljubljana, Slovenia, 1991. After the declaration of independence on June 25, 1991, Slovenia was at war for ten days with the Federal Yugoslav army. Near Ljubljana, Slovenia, July 1991. 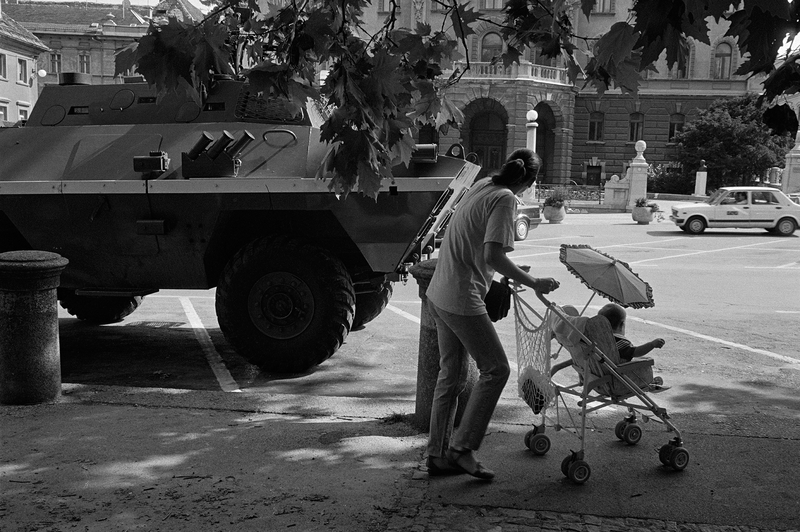 A Slovenian looter is searching for goods near a Federal Yugoslav armoured car that had been under heavy fire an hour before. 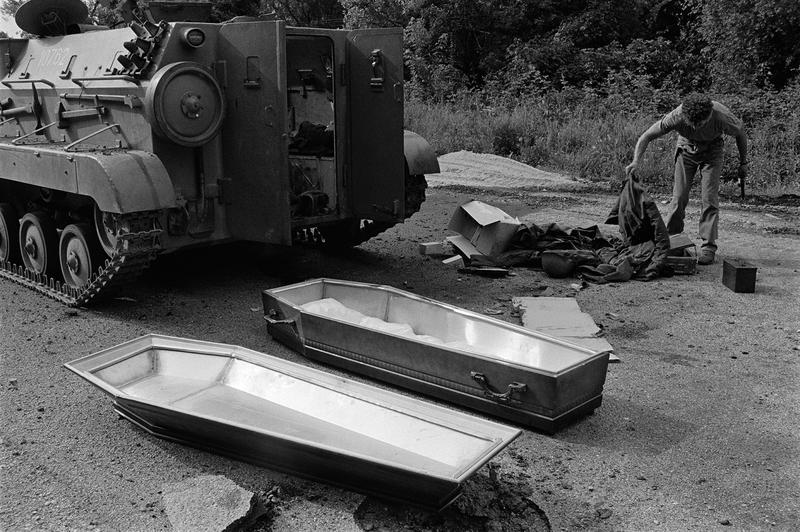 All conscript Federal Yugoslav soldiers in the armoured car died in the attack. 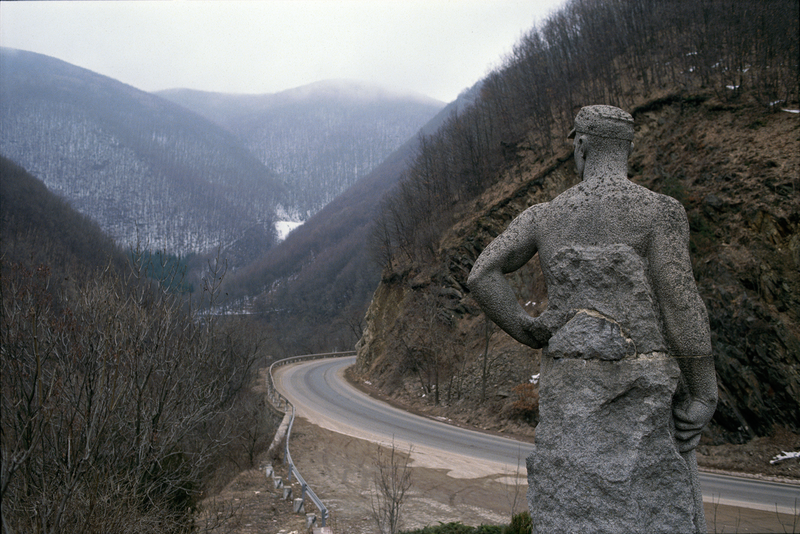 Near Ljubljana, Slovenia, 1991. Federal convoy trapped by Slovenian forces. 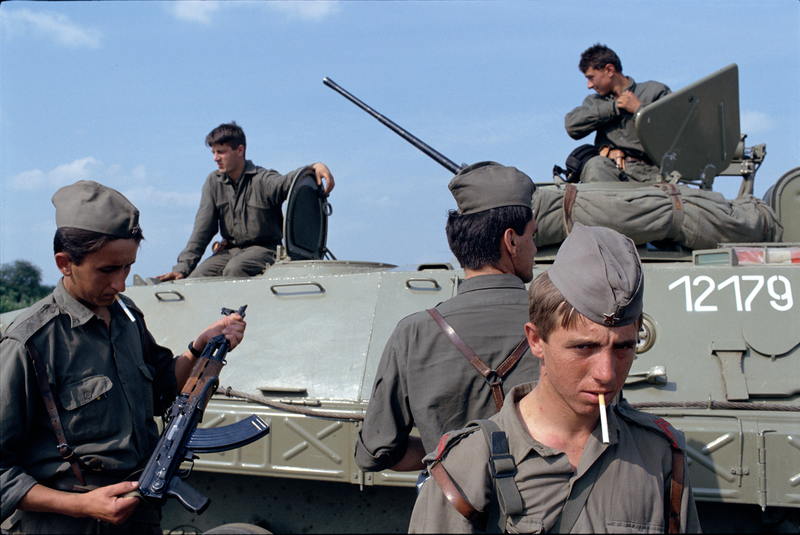 The Ten-Day War between the Slovenian forces and the Federal Yugoslav army started on June 27 and lasted until July 7, 1991 when the Brijuni Agreement was made, with the European Community as a mediator. Near Ljubljana, Slovenia, July 1991. Federal tank convoy trapped by Slovenian forces. The civil war in former Yugoslavia spread to Croatia (1991-1995), Bosnia (1992-1995) and Kosovo/Serbia (1998-1999) and ended with NATO bombardments.It is estimated by humanitarian organizations that around 140,000 people were killed in the conflicts.